Root canal treatment falls under the umbrella of endodontic therapy in the dental field. Unlike general and cosmetic dentistry, endodontics is solely focused on the treatment of problems inside of a tooth, including dental decay and abscesses. These problems are usually a result of untreated cavities or a traumatic injury to the tooth. A root canal stops dental infections before they can claim your teeth. Learn the process involved when you visit the dentist for root canal therapy. Your dentist’s first goal during a root canal procedure is to remove the damaged tissue and nerves that are causing you pain. First, you’ll be numbed to ensure minimal discomfort. 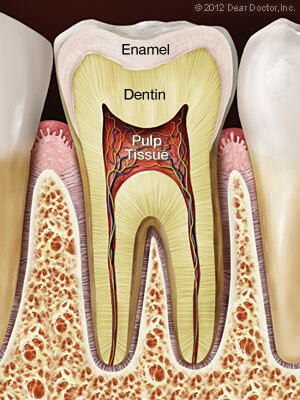 Each of the canals are then thoroughly cleaned of the inflamed pulp that is causing the infection. The extent of a tooth infection can be identified by your dentist through X-rays. After the diseased inner pulp is removed, the tooth is then disinfected to make sure that all traces of the infection are gone. After that, the tooth is filled with a plastic material called gutta-percha (also called root canal filling). A tooth-colored filling is added on top of that for additional protection from future infections. After root canal therapy, your dentist may temporarily cover the treated tooth while a permanent crown is being created for you. In a couple of weeks, you’ll revisit the office to have your custom crown bonded to the tooth. This is the final step of a root canal—your tooth now has a chance to heal, protected, secure, and clean. Stay in touch with your dentist after a root canal and be sure to schedule a follow-up appointment. Dr. Sean Stannard and Dr. David Studt specialize in root canal therapy and other endodontic treatments at their office in Waterford, MI. They will help you determine if a root canal is the right treatment for you at this time. Call (248) 673-7300 today to schedule an appointment for X-rays and an exam at Stannard & Studt Dentistry.